Your Immune System is critical to keeping you healthy. Products to Protect Your "Immune System"
Your body has a protective mechanism built in called the immune system. This immunity system is designed to defend you against invading bacteria, microbes, and viruses; toxins and parasites, that would love to invade your body. In order to understand the power of this system, all that you have to do is look at what happens when something dies. I know that sounds disgusting, but think about it. When you die, your immune system shuts down. Then within a matter of hours, the body is invaded by bacteria, microbes, parasites, and fungi that immediately begin to break down the tissues, and in a matter of days or weeks, there is nothing left of the body except a skeleton. This system is an intricate dance between the Lymphatic system, the Thymus gland, the Spleen, Bone Marrow, White Blood Cells, Complement system, Hormones and Skin. Your skin is the first defense against outside invaders. Did you know that your skin has an anti-bacterial substance in it? That is why you don't wake up in the morning covered with a morning layer of mold. Most bacteria and mold die very quickly on the skin. Your nose, mouth, and eyes also have built in defense mechanisms. Tears and mucus contain an enzyme (LYSOZYME) that breaks down the cell walls of many bacteria. Saliva is also anti-bacterial. Mast cells line the nasal passages, throat, and lungs. Any bacteria or virus that wants to gain entry must first make it past these defenses. Anything that gets through these defenses then has to contend with the rest of the system. We have the lymphatic system that filters the blood, the spleen that also filters the blood, looks for foreign cells, and removes old red blood cells. A person missing their spleen gets sick more often than one who still has it. 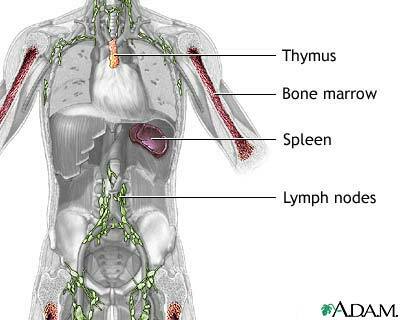 The thymus gland lives in your chest near the heart, and produces T-cells, which provide antibodies to fight infection. The white blood cells produce Y shaped proteins that respond to a specific antigen (bacteria, virus, toxin) and binds to it. 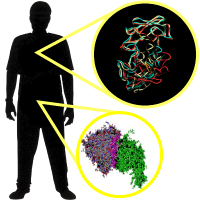 This binding prevents the toxin from moving through the cell walls. A large number of of antibodies can bind to an invader and signal to the complement system that the invader needs to be removed. The complement system is also a series of proteins. Although there are millions of antibodies in the blood stream, the complement system only has a handful, that are produced in the liver. They float freely in the blood and are activated by and work in complement of the antibodies. They cause bursting of cells and signal to phagocytes that a cell needs to be removed. Yes the this immunity system is complex, and each part of it must work in sync with the other parts for it to function properly. We have found some new products that can help you to keep your system working at peak performance levels. In order to keep your immune your system strong, you need key nutrients to support your body's fight to stay healthy. 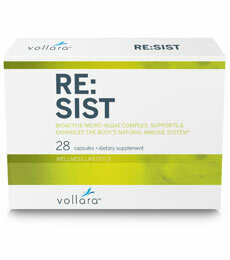 Re:Sist, a blend of the powerful ImmunXT extract, Vitamin C and Zinc, helps to regulate the body's immunity system responses and support cell activity. ImmunXT, the key ingredient in Re:Sist, has shown positive results, in a number of clinical trials, by enhancing innate and adaptive immune system function. Your immunity system is the body's defense against infectious organisms and viruses. It is made up of a network of cells, tissues, and organs that work together to protect the body. Through a series of steps called the immune response, the immune system attacks organisms and substances that invade our systems. In most cases, the immune system does a great job of keeping people healthy, but sometimes it can face serious challenges. Help your natural defense system with Re:Sist, a unique combination of natural extracts and vitamins. The Re:Sist proprietary formulation contains ImmunXT™, a patented micro-algae complex recognized by leading clinical scientists as supporting a balanced immune system. For over 10 years, botanical extracts and known immune stimulation products were researched and tested by leading research scientists at a major U.S. institution. A patented Bioassey testing procedure was developed in order to determine which botanical extract had the greatest potential to support the activity of the innate immune system. During the research process, it was discovered that crude Arthrospira platensis had the strongest ability (at least 1,000 times greater) to balance and support the human immune system when compared to other known botanical immune stimulation extracts. In order to produce the most powerful immunostimulatory compounds from Arthrospira platensis, a patented extraction process was developed and as a result, the ImmuXT extract was born. ImmunXT is proven to be 1,000 times more active in stimulating macrophage activation as determined in human THP-1 cells, a significant immune system response when compared to other immunotherapy treatments. ImmunXT assists the innate immune system by boosting Natural Killer cell activity and increasing phagocytosis, the removal of pathogens and destroyed cell debris. Older adults have experienced increased production of Th cells, which increases the power of the adaptive immune system. * The heart of Re:Sist is ImmuXT, a patented, clinically-tested, all-natural, micro-algae complex supplement that is extracted from Arthrospira platensis. * Vitamin C. also known as ascorbic acid is required for the growth and repair of tissues in all parts of the body. One of its major functions is to help in the creation of collagen, a protein used to make skin, scar tissue, tendons, ligaments and blood vessels. * Vitamin C is essential to properly heal wounds and for the repair and maintenance of cartilage, bones and teeth. It is an antioxidant vitamin, helping to prevent damaging free radicals. * Vitamin C also assists in immune support by activating neutrophils, the most prevalent white blood cells that work as the frontline defense. It also seems to increase production of lymphocytes, the white blood cells important in antibody production and in coordinating the cellular immune functions. * Zinc is crucial for normal development and function of cells such as neutrophils and natural killer cells. * Zinc deficiency also affects development of adaptive immunity by preventing both the growth and certain functions of Th cells. It plays a role in cell division, cell growth, the healing of wounds and the break down of carbohydrates and helps to maintain lymphocyte function. * Re:Sist contains a proprietary blend of herbal extracts including ImmuXT, Elderberry fruit extract, astragalus root extract, Echinacea extract, Reishi mushroom, Aloe barbadensis and Larch tree arabinoglactans. Our blend of extracts supports and maintains the immune system and includes antioxidants to prevent damaging free radicals. * Elderberry fruit extract contains natural antioxidants called flavonoids to protect the cells from free radical damage and anthocyanines which stimulate the immune system by supporting the production of cytokines. * Astragalus root extract supports the cytotoxicity and activity of NK cells and macrophages and increases T-cell activity. * Echinacea extract supports phagocytic activity of macrophages, thus keeping the immune system alert to any potential pathogens and helps to eliminate free radicals. * Reishi mushroom has antioxidant properties by eliminating hydroxyl free radicals and creates an antiviral effect by inducing interferon production. * Aloe barbadensis maintains the production of T-lymphocyte cells and supports phagocytosis. * Larch tree arabinogalactans supports NK cell cytotoxicity and increases the release of gamma interferon. These two supplements will help to protect you from colds, flu, and allergies by keeping your immune system working at its peak level. Click here to purchase "Immune System Supplements"